Here at CoPlant we offer a wide selection of dumpers available in a number of different sizes from a range of manufacturers. With over 15 years of experience in buying and selling dumpers, we have the skills and expertise needed to find the right dumper for you at the right price. We understand it can be a tiresome and costly process to find the best dumper to suit each job, so that is why we offer a tailored customer service approach, to ensure we understand exactly what you need. Our ever-changing stock means that if we do not currently have an item available, we are usually able to locate the required machine within a couple of days. Please rest assured that your project’s demands will be met by the team at CoPlant. Our focus is on making sure our customers get the best machines at the best prices, and in order to ensure this, each of our machines is hand picked by our managing director and assessed by our experienced, knowledgeable workshop staff who will then carry out any repairs needed. This ensures all our machines are of a high standard and ready to get to work as soon as they arrive on site. Small dumpers usually have a load capacity of 1 to 1.5 ton, and with a forward tipping dumper, transporting high volume materials is easy and smooth. These are also known as site dumpers. Dumpers of this size have a proven record of being safe and easy to maintain, with the added benefit of being able to manoeuvre into small or hard to reach areas thanks to their size. These have the ability to carry more than their smaller counterparts and are generally rugged and durable machines. For the ultimate in job site versatility, swivel tip dumpers can rotate a load through 90 degrees to each side of the machine before tipping, therefore making them the ideal machines for backfilling trenches and working in confined spaces. Due to being a mid-size dumper, 3 ton machines offer have proven to be versatile machines with the ability to perform on any site necessary. They are built to last and have therefore proven popular in the hire market. Many 3 and 6 ton dumpers have a heavy duty damage resistant chassis which help them deal even the toughest work sites. When purchasing a used dumper, you should be wary of any wear and tear. Dumpers are often used in the harshest conditions, which can compromise their framework, so, it is important to look for a dumper which is double framed as this offers greater durability during heavy loading. Buyers should also look at the motor and the horsepower of the vehicle along with the transmission type. All components should be in proper working order. The dump bed and hoist should function as intended. All of the lights should work properly and the tyres should not have any excessive wear. If the vehicle has air brakes, buyers should ensure that the low pressure warning buzzer works and that the component has no air leaks. It is also important to examine the box, liners, and articulation joints. 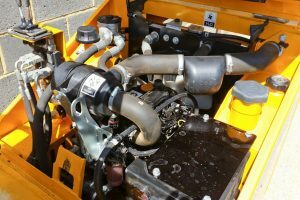 In addition to visually inspecting the dumper, buyers should conduct an oil analysis by opening the bonnet, looking at the engine and filters, and checking the fluid levels. All fluids should be at the proper levels. Buyers should also inspect the oil filters or air filters for predetermined installation or removal date stamps. The number of hours the dumper vehicle has been used can offer an insight into its condition. Buyers should look for dumper that have less than 10,000 hours of use. After this time, many vehicles start to show signs of wear and tear and their lifespan decreases significantly. In general, the lifespan of dumper vehicles tends to range between 9,000 and 15,000 hours, depending on how well the dumper has been cared for. Buyers should find out if it is possible to test drive the dumper before purchase. At CoPlant, we encourage our customers to come a try our machines before making a purchase. We will discuss your needs with you and ensure that we find a suitable machine, so why not check out the dumpers we currently have in stock or give us a call today on 01303 844447.